Roth OLi POWA-5 review | What Hi-Fi? Powered speakers are a neat option: an amplifier built into the speaker cabinet gives you positioning flexibility and avoids the need to invest in a separate amp. It’s no wonder, then, that British company Roth Audio has ventured into this realm. The Roth POWA-5, from the well-respected OLi range of affordable speakers, is the firm’s first attempt at powered speakers. With the Roth OLi POWA-5, one speaker contains the amplification, power and connections, while the other functions as a conventional passive loudspeaker. Inside the master speaker, there’s a 2 x 40W Class D amplifier powering a 25mm soft-dome tweeter and a 13cm mid/bass Kevlar cone. To get started, plug the speaker into the mains, and then connect a short length of cable between the powered speaker and its passive twin. The next step is to connect the speakers to a source, and it’s here that the POWA-5s show off their versatility. Housed on the rear panel of the powered speaker is an array of analogue and digital connections that’s pretty impressive given the £250 price tag. A pair of RCA line-level inputs allow you to connect the speakers to a CD player, while you can improve the sound coming out of your TV by connecting it to either of Roth’s two digital optical inputs. There’s a 3.5mm auxiliary input to play music from MP3 players but, best of all, there’s also a built-in Bluetooth receiver, which means you can wirelessly stream music from any Bluetooth-enabled device. Whether you’re using Apple, Android or Windows, you can play your tunes straight from your smartphone or tablet – a fact that’s sure to be popular with buyers. And to top it all off, there are two USB ports to charge your devices and a subwoofer output (just in case you want some extra bass to create a 2.1 system). The POWA-5s themselves are solidly built standmounters (aside from the slightly flimsy volume control) that come in three high-gloss finishes of black, red or white. They’re also a good size to position anywhere in the room, although they aren’t quite as compact as the Award-winning Epoz Aktimate Micros if you’re after a desktop solution. Start spinning Amanda Palmer’s The Bed Song and the POWA-5s deliver a strong and solid sound, the piano notes having satisfying weight. There’s good integration between the drivers; the top end is comfortable and doesn’t have any harsh edge to it, while the bass lines are chunky. The bass can tip towards being a bit boomy – especially when placed on a desk, less so when on stands – but you can adjust the bass and treble levels using the dinky remote, which helps a little. Play Don’t Give Up by The Noisettes, and the POWA-5s seem to plod along a little bit, preferring ease over excitement and agility. It’s also not the most refined or precise sound – a touch more subtlety could liven up the Roths’ performance. Still, on the whole they are perfectly pleasant to listen to. They offer a gentle and undemanding musical experience. 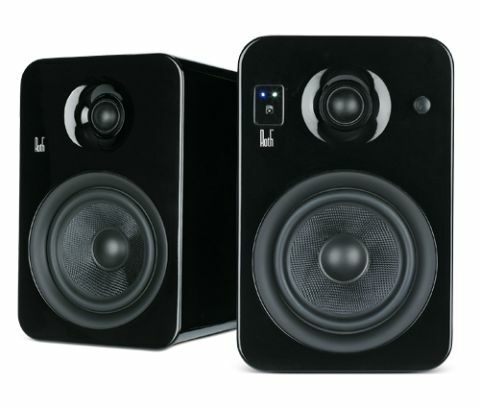 For the modest outlay of £250, you’re getting a great set of features and good sound quality. There are class rivals that deliver a livelier and more insightful sound, but the POWA-5s are a versatile, easy-going pair of speakers that represent good value.